The modern notion of tolerance--the welcoming of diversity as a force for the common good--emerged in the Enlightenment in the wake of centuries of religious wars. First elaborated by philosophers such as John Locke and Voltaire, religious tolerance gradually gained ground in Europe and North America. But with the resurgence of fanaticism and terrorism, religious tolerance is increasingly being challenged by frightened publics. 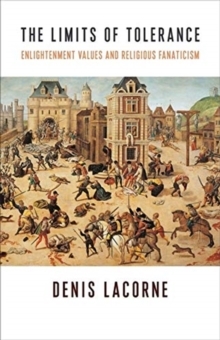 In this book, Denis Lacorne traces the emergence of the modern notion of religious tolerance in order to rethink how we should respond to its contemporary tensions. In a wide-ranging argument that spans the Ottoman Empire, the Venetian republic, and recent controversies such as France's burqa ban and the white-supremacist rally in Charlottesville, The Limits of Tolerance probes crucial questions: Should we impose limits on freedom of expression in the name of human dignity or decency? Should we accept religious symbols in the public square? Can we tolerate the intolerant? While acknowledging that tolerance can never be entirely without limits, Lacorne defends the Enlightenment concept against recent attempts to circumscribe it, arguing that without it a pluralistic society cannot survive. Awarded the Prix Montyon by the Acad mie Fran aise, The Limits of Tolerance is a powerful reflection on twenty-first-century democracy's most fundamental challenges.